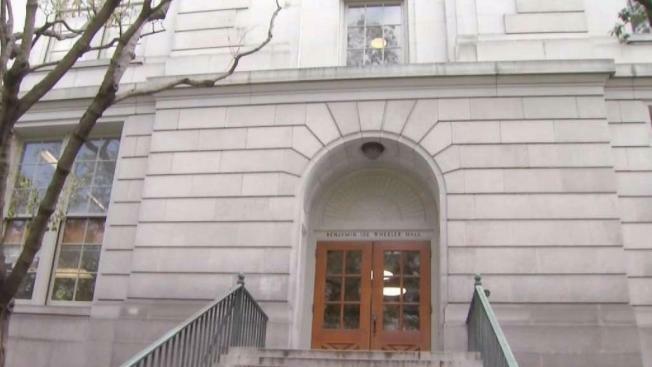 A man attacked a woman with "caustic chemicals" on the University of California at Berkeley campus early Wednesday, UC police reported. A female university employee walked into a bathroom in Wheeler Hall at 1:35 a.m. and saw the male suspect, police said. She then told the man to leave because the building was closed. The suspect followed the woman out of the building and allegedly threw a chemical at her, according to police. The suspect then fled the scene. The victim suffered chemical burns and was taken to an emergency room by Berkeley Fire Department firefighters. Police said they searched the area but could not locate the suspect. Anyone with information about the attack is asked to call UC police at (510) 642-6760.